It is important for those who use makeup products to know what ingredients are contained within them, and a common substance that is often found in many cosmetics is isododecane. This ingredient is an emollient and is often added to products such as mascara, lip gloss, and eyeliner to keep them soft, with the ability to spread easily on skin. Isododecane is used in many different cosmetic items because of its low instance of side effects and because it cannot be absorbed by the skin, and therefore lacks the ability to elicit significant irritation. If you’re concerned about how isododecane might affect your skin or whether you should use any cosmetic products that contain it, you should work closely with your skin care specialist as she may suggest alternative skin treatments that don’t contain this ingredient at all. Because isododecane is such an effective emollient, is allows products such as lip gloss, eye shadow, eyeliner, and SPF-based cosmetics the ability to glide easily across the skin and spread in an even layer for maximum effectiveness. This chemical is also commonly used in anti-aging serums, as it’s important that high-end products spread easily for an even coverage across the entire skin surface to avoid the appearance of patchy skin. Isododecane is also used in the best under eye concealer, where the ability to evenly spread the product is important because of the uneven surface due to wrinkles and fine lines. Another reason why isododecane is used in cosmetic products is due to its non-comedonal properties. This means that it will not clog pores or contribute to the development of acne. This ingredient is extremely light to the touch, making it a perfect addition to “weightless” cosmetic products that are supposed to feel as if they aren’t there at all. Because it is a hydrocarbon, isododecane is highly effective in preventing the evaporation of water from the skin. This means that the makeup will last longer on the skin, and the epidermis will be better moisturized. While isododecane is generally thought to be safe, you may be wondering whether it will have an adverse effect on your skin type. There are several steps you can take, however, to ensure that you use this ingredient safely. First, make an appointment with your dermatologist or skin care specialist. 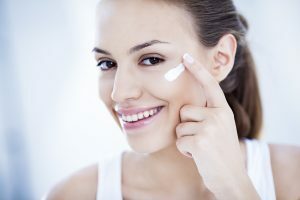 Be sure to talk to your doctor about your skin type (such as whether your skin has reacted negatively to cosmetic products in the past), if you use any type of medicated washes on your face, and what kind of makeup you currently use. All of this information can help your skin care professional discern whether products containing isododecane are right for you. Keep in mind that just because your dermatologist believes isododecane is safe for you, it does not mean that the active ingredients in your skin care products won’t cause an allergic reaction. If your dermatologist has identified your skin as sensitive, avoid products that contain artificial fragrances, or colors, as these may irritate the skin. To date, there have been no recorded side effects associated with isododecane. However, some experts assert that very few tests have actually been performed with it, and that there is always a possibility of an allergic reaction. When you use products that contain this ingredient, be sure to watch out for any type of unusual developments, such as redness, swelling, or itchy hives that leak fluid, as these may be signs of a severe allergic reaction.